Sister Anne Quinn SMSM before a poster featuring Sister Teresia SMSM and a Jamaican Family. Two Marist missionary sisters on a six-week tour of Jamaica are deeply moving Australians with stories of guns, drugs and violent crimes. Speaking in Catholic dioceses across Australia as guests of Catholic Mission, Fijian Sister Teresia Tinanisolo and Australian Sister Anne Quinn have already brought some to tears, revealing the plight of the many young families to whom they offer spiritual and practical support. The visit comes as a part of Catholic Mission’s 2014 World Mission Month campaign, ‘When I grow up I want to be… Alive’, which throughout October will focus on Jamaica—a nation deeply troubled by violence and crime. With the second highest rate of shooting deaths in the world, Jamaica’s crime has spiralled out of control in recent years. Catholic Mission supports a number of programs aimed at creating brighter futures for the local youth, and the two Marist sisters are here to tell of what is sometimes an overwhelming task. Born in Fiji, Sr Teresia has worked in Jamaica for nearly twenty years and is currently an administrator at the Holy Family Self Help Centre, which is supported by Catholic Mission. The Centre teaches young people the vocational skills that are crucial to gaining employment in Jamaica’s growing tourism industry. 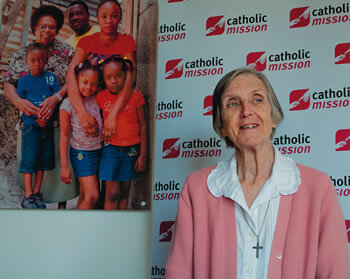 Sr Anne is chairperson at St Anne’s Primary School in the capital, Kingston.